Our hormones are designed to be in balance so that WE feel in balance. Too much estrogen in relation to progesterone translates to estrogen dominance. It can have some very nasty symptoms. The most common are bloating, weight gain, headaches, breast tenderness, irregular periods in menstruating women, PMS and mood swings. It can also cause infertility issues in women in their reproductive years. Women in perimenopause can quickly become estrogen dominant when no ovulation occurs (called anovulatory cycles) which is very common as the ovaries begin to shut down. Loss of libido and fatigue and weight gain are big symptoms in this group. There is help! No woman needs to remain estrogen dominant and suffer from these symptoms. In other words, It’s Your Hormones! Ladies, I have heard this feeling described in many ways over the past 20 years I have been consulting on natural hormones. Usually women are trying to say “I just don’t feel like myself anymore.” The usual complaints are “I’m cranky, depressed, bloated, no energy, cannot focus and I can’t sleep!” “My hair is falling out” is another common complaint. Some women say, “I’ve been told I’m going crazy” by my husband/children/even doctor! What is it really? It is most likely a condition called Estrogen dominance. 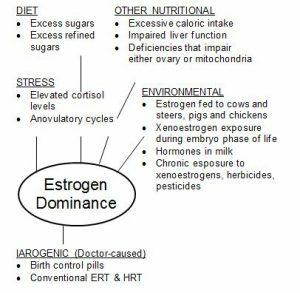 Estrogen dominance refers to a time in a woman’s menstrual life when the primary influencing hormone is estrogen. It describes a condition where a woman can have deficient, normal, or excessive estrogen but has little or no progesterone to balance its effects in the body. These symptoms may sound common to some of you, but they are not normal. If you have any of these symptoms, it is essential to get your hormones back in balance as soon as you can. The symptoms usually will get worse as time goes on, especially the weight gain. 2) as a woman ages she begins to have menstrual cycles during which she does not ovulate (produce an egg) This is called an anovulatory cycle and without the production of an egg, no progesterone is produced. You are now “progesterone deficient”, a very undesirable state. Progesterone is the “feel good” hormone and you will definitely begin to not feel good! Your estrogen hormones now have undue influence on your body and you are Estrogen Dominant. Sadly, many women have experienced this state since puberty causing them to experience mild to severe PMS symptoms which they took as “normal”. Other women develop the condition more gradually. Things are not hopeless! Estrogen Dominance can be stopped and reversed. SUMMARY: Even low estrogen levels can result in estrogen dominance if your body is not producing progesterone every month. You can see, then, that during peri-menopause and menopause even when your estrogen levels drop, estrogen dominance can still be a big problem. You are making no progesterone, but you still make estrogen, primarily estrone, in your fat cells at approximately 50% of what you made before menopause. Estrogen levels never decline to zero. This is a myth! Estrogen dominance is exacerbated if you have been taking synthetic estrogen pills. Why? After a hysterectomy where the ovaries are removed (known as surgical menopause), the doctor will usually prescribe synthetic estrogen hormones or a horse estrogen such as Premarin. This only continues to maintain the estrogen dominant condition which may have caused the problems in the first place. Symptoms of estrogen dominance will persist and worsen on synthetic estrogens. WHAT ARE THE WORSE CAUSES OF ESTROGEN DOMINANCE? When does Estrogen Dominance commonly occur? During peri-menopause or premenopause, when women are not ovulating regularly and thus not producing progesterone. When women are exposed to xenoestrogens. Xenoestrogens are environmental toxins and chemicals present outside the body in the air and food that have an estrogenic effect on the body. When women are taking estrogen replacement therapy. When women are taking birth control pills that are high in estrogen. When a woman has had a hysterectomy and either had her ovaries removed or her ovaries are no longer functioning properly due to the removal of her uterus. Many women do not know that even when the ovaries remain, they function sub-optimally after a hysterectomy. When a woman has had a tubal ligation that is affecting the function of her ovaries. During and after menopause when a woman is making little or no progesterone. When stress is a factor in a woman’s life. Men Can Have Estrogen Dominance: Yes, that’s right, men too. As men age, their estrogen levels gradually rise (xenoestrogens have an effect on them, too) and their progesterone and testosterone levels gradually fall leading to a state of estrogen dominance A sign of estrogen dominance in men is the development of breasts. If a man has signs of developing breasts, he is most probably low in progesterone. 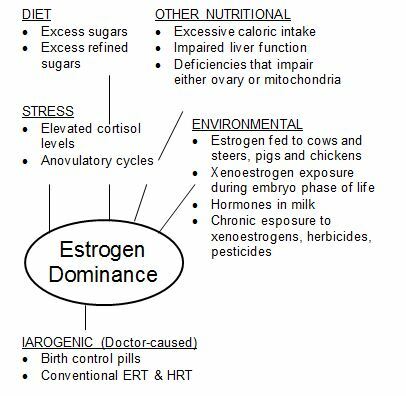 HOW DO I CORRECT ESTROGEN DOMINANCE? The use of natural progesterone crème will usually restore hormonal balance and help a woman “feel like myself” again. Used just 25 days of the month for non-menstruating women and 12 days per month for menstruating women, it can work wonders! IS THERE A DIET THAT CAN HELP WITH ESTROGEN DOMINANCE? I have been researching this for some time and have found the following data for you to help eliminate excess estrogens that may be in your body. Eliminate conventional dairy foods. Try this for about one month. You might notice a huge difference, especially with breast tenderness. I can tell you from my own experience with fibrocystic breasts that this really works! Spend the extra money for organic milk. It is worth it – especially for your teenagers if they drink a lot of milk. Eat cruciferous vegetables in moderate to high amounts broccoli, cabbage, turnips, kale, collard greens, Brussels sprouts. These modulate estrogen levels because they contain indole-3-carbinol. High fiber – fiber decreases total circulating estrogens! It will pull it right out of the body. Best sources: oatmeal, shredded wheat, popcorn. You want about 25 grams per day. Eat organic vegetables as much as possible. My personal rule: If it is something you eat often (for instance, I eat lettuce almost every day), spend the extra money to buy organic. Low fat foods are best because the higher the dietary fat, the higher the estrogen levels. Definitely avoid trans-fatty acids (which, thankfully, is getting easy due to product labeling requirements. Soy foods are good if they are fermented: tofu, miso and tempeh. Processed soy products are not beneficial. In fact, they can negatively affect the thyroid. Help! Why am I suddenly shaped like a Pear or Why do I have this sudden Belly Fat? I’m not eating any differently! I look down and see a Pooch! 2) the change in the shape of their bodies. You ask, what is going on? You describe it as a “spare tire” or, in today’s jargon, a “muffin top” You have new fat accumulated around your stomach, buttocks and thighs! Somehow this might be easier to take if it was evenly distributed over your entire body. Instead, you have pants that don’t fit, zippers left undone and are investing in tunic tops . WHAT’S GOING ON? It’s HORMONAL! When hormones become unbalanced and estrogen dominance occurs, the average man or woman may add 1-2 pounds per year between ages 35 and 55. This weight goes right around the middle and can be almost nuclear as far as losing the weight until hormones are balanced. •	Causes abdominal tissues to retain water and causes BLOATING. When you are menstruating, this bloating occurs right around the menstrual cycle. When you no longer have periods and are not producing progesterone, the bloating will be a constant problem. •	Estrogen prompts your body to CONVERT CALORIES INTO FAT instead of using them for energy. •	Estrogen dominance causes the fat to be stored IN THE ABDOMINAL AREA. Abdominal fat is a sign that the body’s internal hormonal ratio of progesterone to estrogen is disturbed. WHAT’S ELSE IS GOING ON? Could it be my thyroid? YES! It’s all related! Thyroid is negatively affected when progesterone is low. Studies reveal that estrogen dominance can cause an increase in thyroid binding globulin, placing the thyroid into a sluggish state. Of course, the thyroid gland affects metabolism and when it is not working properly, all of your dieting and exercise will be futile. I always tell women that Thyroid and Progesterone are Best Friends; The Thyroid gland needs you to have your progesterone/estrogen balanced to keep your metabolism strong. ANOTHER THING: WHY AM I CRAVING SUGAR? The Answer Is: Estrogen dominance can cause insulin to be released more often than it is needed due to a condition called insulin resistance. This extra release of insulin causes the body to crave sugar. As you know, these cravings can be uncontrollable in nature. No matter how hard you try, you find yourself eating when you are not hungry, and you cannot stop your brain from demanding that you consume something sweet. Solution: Progesterone balances estrogen and regulates the release of insulin. Did you know that insulin spikes cause the body to store fat? Are you getting the total picture? It is ALL PREVENTABLE with hormone balance! Estrogen levels impact where the body distributes fat. Estrogen is made and maintained by abdominal fat so fat cells accumulate around the abdomen when you are estrogen dominant It is a very vicious cycle. Fat cells make estrogen and, in turn, the estrogen tells your body to store fat. Without balancing your hormones, you will NOT break the cycle no matter how hard you diet or exercise! WHAT IS YOUR SECRET WEAPON? NATURAL PROGESTERONE! A very simple, inexpensive investment! •	Hormone balance helps keep serotonin at normal levels. Serotonin helps the body control appetite, food cravings and binge eating. Non-menstruating Women: ¼ tsp for 25 days each month. Take a 5 day break. HERE’S WHAT WOMEN ARE SAYING ~ you CAN lose that Abdominal Fat, too! I am 51 years old and have had no waist line for quite some time! I always felt bloated and sluggish. I have used natural progesterone crème for 1 month now and my waist line is back! I can feel my body going down every day. Also, my energy is rising! over-the-counter. Look for a crème containing 1000 mg of progesterone in a 2 ounce jar. Simply use as directed.